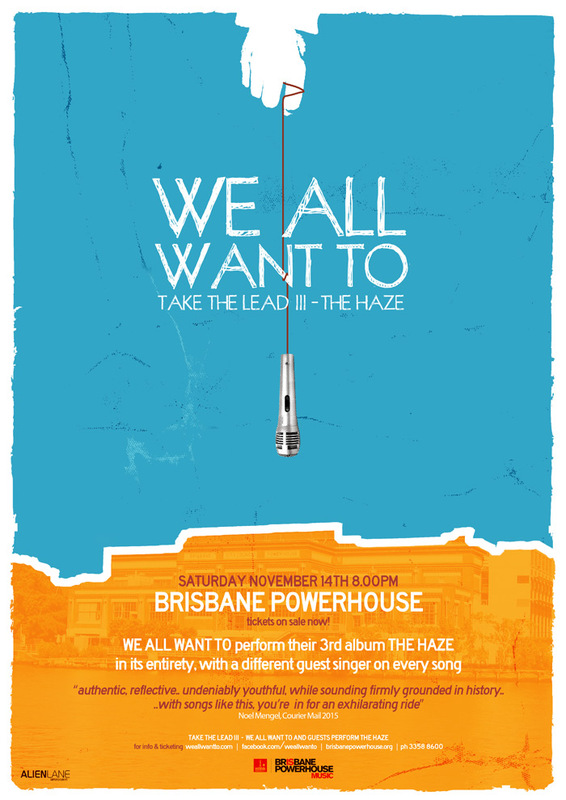 We are bringing our latest album THE HAZE to life with an assortment of guest vocalists when on Saturday 14 November at Brisbane Powerhouse. Take the Lead III is the latest instalment of our series of gigs where we hand the over microphones to some of Brisbane’s favourite vocalists. Previous concerts in the series have seen luminaries Sue Ray, McKiscko, Sabrina Lawrie, Jeremy Neale, Dom Miller, Charles Sale and many others tackle the our songs. We can’t wait. If you came to Take The Lead at the Judith Wright Centre in 2013, or Take The Lead II – Chicas at the Old Museum last year, you’re gonna love this one. Discount codes have just been announced: If you get tickets in advance you can get $15 tickets ($10 off) + transaction fee. Codeword: “Mates“. If you use the codeword “plusone” you will get two tickets for the price of one. Notes: Take The Lead II, WE ALL WANT TO and guests perform THE HAZE.